If you want to see Snow Monkey? Snow monkey park (Jigokudani) is one of the best place you can see Snow Monkey. Snow Monkey in Jigokudani enjoy Onsen, and they look really relaxing especially in heavy snow in winter. The Boss Monkey in this park is named "Ryuou," the king of Dragon. 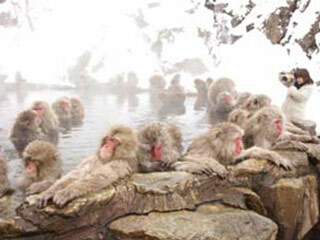 Jigokudani Monkey Park is where you can see snow monkeys in Onsen. It is located Jigokudani Onsen in Nagano prefecture. It is the facility for preserving and studying wild Japanese Macaque, a.k.a. Snow Monkey. Snow Mokeys enjoy Onsen through all seasons. There are many Onsen which also available to see wild Snow Monkeys in Onsen, but Jigokudani is one of the most certain spot which you can always enjoy them in Onsen. They make Onsen looks so relaxing especially during the winter with heavy snow. 8:00 start sign up at the parking. 8:15 the bus leave Shinjuku. 10:00 stop for restroom break. 18:30 stop for restroom break. 21:00 back at Shinjuku Station. Japanese Macaque, a.k.a. Snow Monkey ... is one a native species of Japan, and only monkeys which live in cold weather with snow. They survive winter temperature below - 15 degree celsius, 5F. In Japanese, they are called "Nihonzaru." Japanese Macaque lives in mountains area of Honshu. The most notable things for Japanese Macaque is that they enjoy Onsen like human.